The 6th Annual Fraser Valley food show is around the corner! All Foodies….. Mark your calendars for Oct 4,5 & 6th and make plans to et out to what looks to be a great new show! As always there is a great list of local product booths as well as some great educational experiences with the Dairy Farmers of Canada…. Sausage making competition as well as a Top Chef stage / competition. Purchase your admission tickets online now and save $2.00 off the regular adult entrance fee! Purchase your adult ticket for only $7 instead of the gate price of $9 (includes all taxes and service fees). Purchase your tickets by Sept 17th and be eligible to win a prize package. Our Sept 3 winner was Eric T. of Abbotsford! The central focal point of The Fraser Valley Food Show is, without a doubt, the Celebrity Cooking Stage where Food Network Canada’s superstars will dazzle the audience with their amazing talent, wit and humour. The driving culinary force behind Cactus Restaurants Ltd., the award-winning collection of 23 casual fine dining restaurants in BC and Alberta, Rob Feenie is also one of Canada’s most recognized and celebrated chefs. At Cactus Restaurants Ltd., Chef Feenie leads the culinary team, blending his talent for creating elegant, globally-inspired cuisine with his passion for simple dishes using fresh, local ingredients. Chef Feenie’s innovative approach to cooking has continued to drive the evolution of Cactus Club Cafe’s menu selections and its commitment to sourcing the best fresh, local and sustainable products wherever possible. Growing up in Burnaby, BC, Chef Feenie first developed a curiosity for international cuisine over countless traditional family dinners at his Japanese neighbours’ home. This early experience was followed by a high school exchange program where he was first introduced to European chefs and techniques. At 20, Chef Feenie attended the Dubrulle Culinary Institute in Vancouver and upon graduating, became a Sous-chef in some of Western Canada’s top restaurants, notably Le Crocodile and Cherry Stone Cove in Vancouver and The Rim Rock Café in Whistler. While at Le Crocodile he began a series of work and educational trips, or stages, throughout Europe and North America, starting in Alsace with Chef Emile Jung at Au Crocodile and Chef Antoine Westermann at Le Buerehiesel, both Michelin three-star rated restaurants. In North America he worked with Chef Charlie Trotter, at Trotter’s Restaurant in Chicago, and Chef Jean-Georges Vongerichten at Jean-Georges in New York. In 1995 Chef Feenie opened the internationally celebrated Lumière Restaurant in Vancouver, followed by Lumière Tasting Bar and then Feenie’s, a more casual Canadian Bistro, next door to Lumière, in 2003. 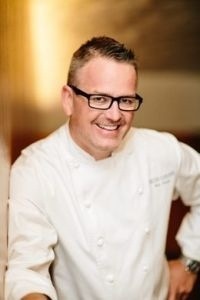 Throughout his career, Chef Feenie has secured international culinary recognition, including the coveted Relais Gourmand and Traditions et Qualitè designations, in addition to the Mobil Travel Guide four-stars designation and the AAA Five Diamond Award. In 2009 and 2011, Chef Feenie won the Vancouver Gold Medal Plates competition, and won silver at the national level in 2012. Chef Feenie has published four cookbooks: Rob Feenie’s Casual Classics, Rob Feenie Cooks at Lumière, Lumière Light and Feenie’s. 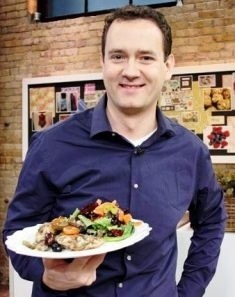 He also starred on New Classics with Chef Rob Feenie on Food Network Canada for five seasons. In 2005 Feenie became the first Canadian to win on the popular television show Iron Chef America by defeating Chef Masaharu Morimoto. Charming, creative, and tough, Chef Corbin is a credited Executive Chef and host of DINNER PARTY WARS who is currently working on his own cookbook, three new restaurants, and a full-service catering business. A regular on RESTAURANT MAKEOVER (HGTV/Food Network), Chef Corbin made his TV debut in CRASH MY KITCHEN (Food Network) and has since won over a huge following of fans who want to cook like him, viewers who want to emulate his culinary style, and legions of up-and-coming chefs who want to train under him. Honing his expert skills in the kitchen under his mother’s tutelage, Chef Corbin is known to right culinary wrongs on DINNER PARTY WARS with charismatic honesty and educational know-how. He is always ready to applaud a delicious meal or rebuild lackluster menus with his signature flair and attention to detail. Chef Corbin is also an active member of the Canadian Federation of Chefs and Cooks and volunteers in the community for charitable organizations including CANFAR, Canadian Heart and Stroke Association, Osteoporosis Canada, Diabetes Canada, and United Way Canada. He works with Chef Net Work Inc., where he travels throughout Canada, the U.S.A., and Mexico to showcase his talents and provide superior presentations, food demonstrations, and product endorsements. Matthew grew up in Surrey and is a proud husband, father, Canadian Chef and cookbook author. At the young age of 15, Matthew fell in love with cooking. Following high school, and this passion, Stowe graduated from New York’s prestigious Culinary Institute of America in 2002. After graduation he further honed his craft at NYC’s famed French restaurant, Lutèce. As Executive Chef of Sonora Resort in B.C. from 2004-2010, Matthew played an integral role in the resort achieving the coveted Relais & Châteaux designation in 2009. That same year, Chef Stowe also wrote his first cookbook, The Tastes of Sonora Resort which highlighted his signature dishes from his time at the coastal resort. Chef Stowe plans on opening up his own restaurant in the future. Currently he is excited to continue working with Cactus Restaurant Ltd. president and founder, Richard Jaffray as a Product Development Chef on continuous menu development and Cactus’ aggressive, nationwide, growth plan. Most recently, Matthew was named the winner of Top Chef Canada for the third season of Food Network Canada’s competitive culinary show. Matthew is a passionate and focused Chef who prides his style on refined Canadian cuisine with modern techniques. 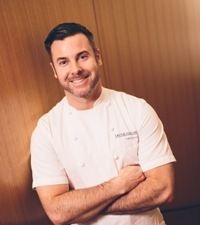 For up to date information on what Chef Stowe is doing, visit him on facebook (https://www.facebook.com/ChefMatthewStowe), twitter (https://twitter.com/chefmattstowe) or website (www.matthewstowe.ca). Following in his father’s footsteps, William developed a passion for food and the culinary arts at a very young age. While working alongside his father, he learned the fundamentals of Asian cuisine. William’s first formal position in the restaurant industry was at the Delta Pacific Hotel and Conference Centre and Resorts where he worked under the tutelage of Chef Wolfgang Leske. During his time here, William was exposed to Culinary Team Canada and the world of culinary competitions, earning his Red Seal as well as silver and bronze medals at various culinary shows. Goldfish Pacific Kitchen marks William’s first foray as Executive Chef, where he spent 6 months developing menu items before its opening. Goldfish helped define William’s food and his creative flare. In August of 2010 William decided it was time for a new challenge, at which time he assumed the role of Executive Chef of the Sandbar Seafood Restaurant. Sandbar embraces the ultimate Vancouver food destination: a multitude of cultures from Japanese, to Chinese, to West Coast. This lends well to William’s style, the blending of cultures yet keeping the integrity of tradition. Food creation is one of William’s passions, and attending local food events and culinary competitions; William’s goal is to expose Vancouver to his food. Doing his part to help define the food scene in Vancouver, William is an active member of the Ocean Wise program. Chef Chris Remington began his career in cooking at age 20 with EarlsRestaurants. He soon found that cooking was his passion when he went travelling around theworld working in the kitchens of various upscale restaurants across Europe andthe South Pacific. Chris returned to Vancouver and enrolled in the renowned Pacific Institute ofCulinary Arts. While there as a student, he entered the BC ‘Iron Chef Competition. Chris won the Iron Chef title, beating out several of Vancouver’s top chefs. The following year he returned to defend his title, this time beating out one of his culinary instructors to win the competition. Chris then worked in an array of Vancouver’s top restaurants-The Beach Side Cafe in West Vancouver, Sous Chef at the award winning ‘C’ restaurant before becoming the product development chef for Earls. Later he helped to open and create the menu for the award winning Chi restaurant. Once Chi was opened, Chris and his family moved to Penticton to run the kitchen at the ‘Hooded Merganser’. Since that time he has taken over the culinary development of the Penticton Lakeside Resort, where he continues to create fresh, innovative and delicious food today! kitchen as Executive Chef at The Fairmont Waterfront and after a brief sabbatical is excited to dive back into Vancouver’s dynamic restaurant scene as Executive Concept Chef for Frankie’s Italian Kitchen & Bar. You Gotta Go To This!